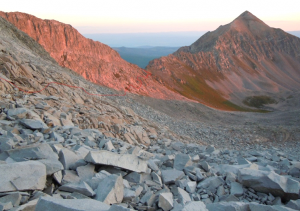 Capitol is considered the hardest 14,000-foot ascent in Colorado for a reason. 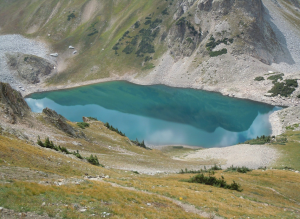 Most climbers do it in 2 days because it begins with a six-mile hike to the pristine Capitol Lake at 11,600 feet. From there the fun begins. 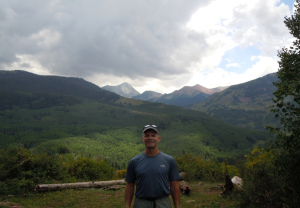 Below is a picture of me just starting the hike from the trailhead. Behind me is the ominous Capitol Peak, the final destination! 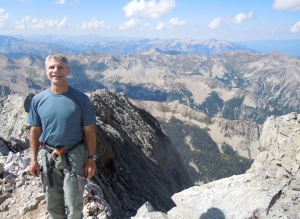 I began the ascent with my mountain guide, Nick, at 1PM on Wednesday, August 28th, under overcast skies, and hiked for 3 ½ hours to our campsite situated just below Capitol Lake. We proceeded to set up camp, then had an early meal and then settled in for the night to the sound of thunder and drizzling rain. The mountains are notorious for afternoon showers so the goal is to rise before dawn and get up to the summit and well down off the mountain no later than 1PM. After nervous tossing and turning all night, Nick woke me at 3:45 and we were on the trail by 4AM utilizing headlamps. By first light we were well on our way up through a massive boulder field. The red line on the photo shows our approximate path. We had to go up, then around the back of the mountain to gain the ridgeline. As we worked up the backside, we first crossed a point on the ridge at 13,400 feet called “K2.” This is at 13,400 feet in elevation. 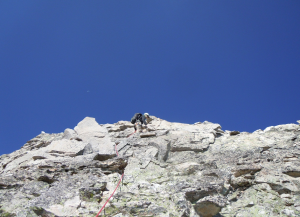 Then we went down again to cross the “knife edge,” a ridge that looks just like it sounds. 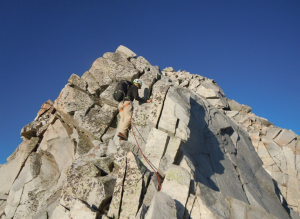 From there, it was another 500 foot elevation gain of Class 4 rock climbing to the summit of Capitol. 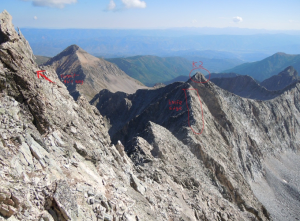 To give you some perspective, below are two shots: One from the front, and another as we approach the summit looking back per the illustration. 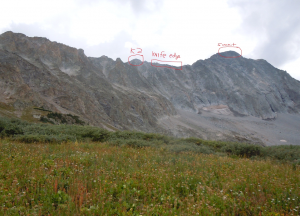 The shot below is from partway looking back at the knife edge.…. 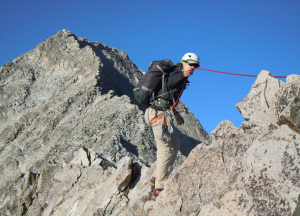 Here, Nick was roping up for the ascent of K2. From this point forward and all the way to the summit, I was roped up for safety (which is actually little consolation when you’re staring down a 1,000 foot drop on both sides). 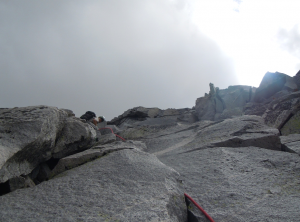 This a shot of the knife edge with Nick leading the way…. I naively thought once we got across the knife edge, it would get easier. As you can tell from this next shot, nothing could be further from the truth. Up, up and away…. We reached the summit at 10:45 AM, 6 ½ hours after we started. I had so much adrenaline running through me that my body didn’t know how to react! Right after we finished eating, the fun ended when I realized that I had to go back down the same way I came up. The only difference going down is the view below… which stares you in the face vividly reminding of the inherent danger of falling… extreme freak factor!! 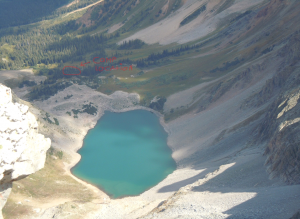 This is a beautiful shot of Capitol Lake from the Knife Edge. I also circled our campsite. Once we passed back over K2, I realized that I was once again safe and I could breathe again. Descending into the valley heading back to our campsite, I snapped this amazing view of Capitol Lake.